OAKLAND, Calif -- The emotions hit Steve Kerr each time he makes the trek back to Oracle Arena. In his fifth season as coach of the Golden State Warriors, Kerr understands just how much the old building, and the emotions fans have shared inside of it for 47 years, means to the Oakland community. That's why as the games roll by during the team's final season inside Oracle, Kerr can feel the significance with each passing day. "It's sad," Kerr told ESPN. "It's sad. Every day that I drive in I think about it. And obviously as the season goes we're getting closer and closer. So it's OK to be excited about the new arena and sad about leaving Oakland. That's how I think everybody feels." After Thursday night's game against the Houston Rockets, there are only 20 regular-season games left at Oracle before the playoffs begin. With only a few months left to perform in the building, the players are trying to enjoy the opportunities they have. 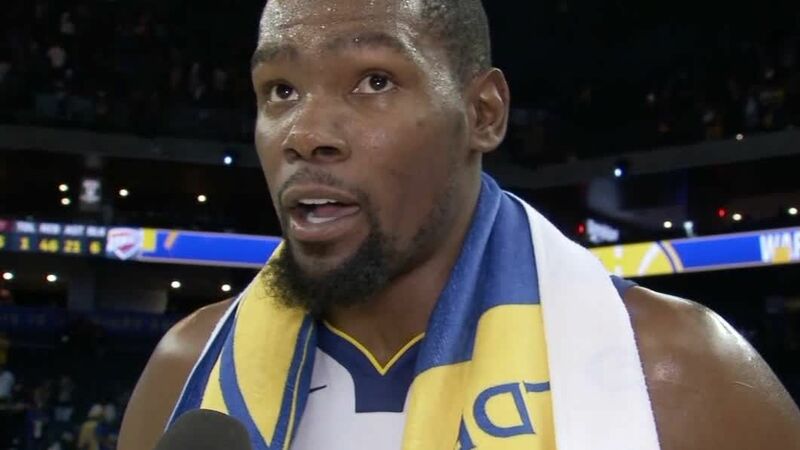 "I think everybody from fans to the players, coaches, everybody involved with the Warriors are going to just live in the moment," forward Kevin Durant told ESPN. "Once that time comes, when it's time to move out of Oracle, everybody's going to remember the great times. Everybody's going to remember the championships and the great players that came through here, the records, and all that stuff that happened in Oracle." The Warriors first played at what is now known as Oracle Arena in 1966-67 -- two years before the current Madison Square Garden in New York opened -- and moved in on a full-time basis in 1971-72. The last time the Warriors called somewhere other than Oakland home was the 1996-97 season, when they played in San Jose while Oracle was being renovated. Oracle has been the team's home for all four championship seasons since moving from Philadelphia, and the arena has seen countless other memorable moments, both for the Warriors and the NBA. It played host to the 2000 All-Star Game and the dunk contest won by Vince Carter that weekend. The Warriors' home garnered national attention for the record-setting crowd noise during the 2007 playoffs, as the team that became known as the "We Believe" Warriors pulled off one of the biggest upsets in NBA postseason history, beating the top-seeded Mavericks in the first round of the playoffs. Warriors forward Jordan Bell has only been with the team for two seasons, but he has heard the stories about those days -- some of the few successful ones during a stretch in the early 2000s that saw more trips to the lottery than the playoffs. And he appreciates the love he has received from local fans during his time in Oakland. Though the team is only moving 16 miles away, Bell knows how deeply the move will be felt throughout the Warriors' current home city. "I'd rather stay in Oakland just because I know that's where the real, true Warrior fans started," he said. "The fan base we have now, people we see at the games, probably aren't the real dedicated fans that we see just because the ticket prices are so high, and before when they were low, if you actually came to the game, even though they sucked, you wanted to see them play, the dedicated fans. So now I don't know, I think it's kind of putting people in a weird situation. ... It's all business at the end of the day. [The owners] think it's a better situation to move, I guess." To Bell's point, Warriors personnel are beaming about the opportunities the Chase Center -- a state-of-the-art building in San Francisco that the organization expects will become one of the top venues for sports and entertainment in the world -- will give the organization and the Bay Area community. But as the finishing touches are put into place on the team's new palace, Warriors players and coaches are growing nostalgic about an old building that has served as their home base for so much joy in recent years. "It seems like the longest six-, seven-year tease of all time," Warriors guard Stephen Curry said. "Because when Joe [Lacob] and Peter [Guber] bought the team that was one of their first announcements in terms of plans to move the team [to San Francisco]. ... It's just been constant updates, but nothing has technically sunk in yet [that] this is a real reality." Durant, who will be a free agent at season's end, is trying to maintain a positive perspective on the move. While he was noncommittal about his future during a recent tour of Chase Center, he did enjoy seeing the way the building was coming together. But Durant has already called three different buildings "home" during his NBA career. Curry, on the other hand, has never had a professional home other than Oakland. It's where he made his NBA debut in 2009, where he became known for his famed "tunnel shot" -- a routine that might have to change at the new arena -- and where he won back-to-back MVPs to go along with three NBA titles. As the face of the franchise, Curry has been respectful of what the Warriors mean to the Oakland community, paying homage to the city on his current Under Armour sneaker line, and even expressing regret that the team hasn't worn throwback jerseys from the "We Believe" era -- the same style of jersey he wore as a rookie. "Honestly, I haven't even been to the Chase Center, so it hasn't really sunk in that Oracle won't be the home court anymore," Curry said. "But in terms of framing my specific journey in the last 10 years playing in Oakland ... why it's important for me to reflect on what this season means, not just trying to win a championship, but doing it in the last year playing in front of a fan base on this side of the Bridge that supported us for the last 47-plus years. It's just weird, the best way I can describe it." The organization has been careful to frame this season as the last in Oracle, but not the last in Oakland, saying the team will maintain ties to the East Bay when it moves across the bridge to San Francisco. They have, however, played up ties to the team's history with marketing images merging past and present, including "Throwback Thursday" nights. The game against the Rockets is '90s night, where the team will celebrate the Run-TMC era Warriors that featured Tim Hardaway and Hall of Famers Mitch Richmond and Chris Mullin. The team has also planned a bobblehead giveaway celebrating one of the moments when Oracle truly became "Roaracle": Baron Davis' thundering dunk over Andrei Kirilenko during the second round of the 2007 playoffs. That is one of many deep and meaningful memories of the team's time at Oracle Arena, many of which this group itself has forged over the past five seasons. Everyone who has been a part of the Warriors' recent championship run seems to have a story or memory that is personal to them. For Kerr, it was the end of Game 5 of the 2015 Western Conference finals. "I remember sitting at the scorer's table and the crowd was electric," Kerr said. "It was so shocking that we were going to the NBA Finals. And I remember I was at the scorer's table with about a minute to go, and I think we were up like 12 or something, so the crowd just picked it up. They knew we were going to win and I was just overcome -- I was like, 'This is the most incredible thing ever right now. We're going to the Finals.' That was even bigger to me than winning the championship there two years later." Durant has experienced both some of the lowest and highest moments in his career at Oracle, going from blowing a 3-1 lead in the Western Conference finals in 2016 while with Oklahoma City to leading the Warriors to a title and winning Finals MVP in the same building a year later. 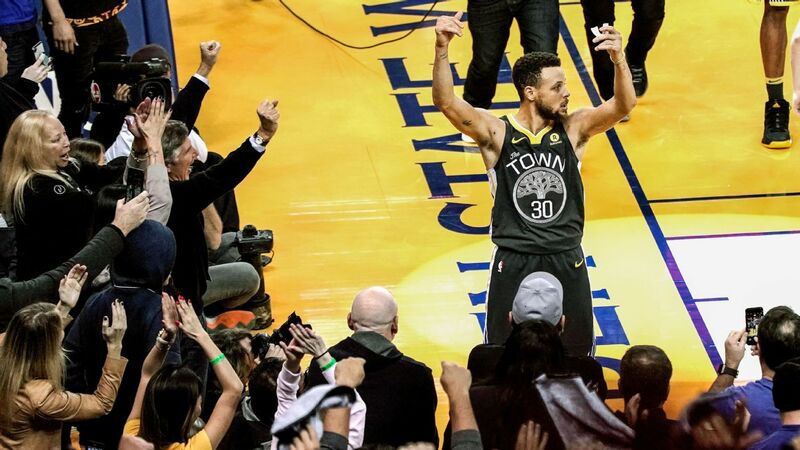 For him, no specific moment will resonate above the general feeling he gets when playing in front of an excited Warriors crowd. "Just the energy," Durant said. "Just the Warrior chants. Hanging up the banners. Just the noise and the energy around the building, especially in the playoffs. It's unmatched. I've played in some incredible arenas in the playoffs with loud crowds, and Oracle probably tops the list." The Warriors are hopeful that their fans in Oakland can continue to bring that same energy through the spring, as they hope to repay the fans by giving them a third consecutive NBA championship to send Oracle Arena out in style. "It's just another motivation," Curry said. "Obviously, chasing championships, that should be motivation enough, in terms of what this would mean. How cool of an experience it would be to walk off Oracle's floor or wherever we're playing, last season in Oakland, have one more parade in downtown and celebrate the right way? It's a storybook [ending] to a great run in Oakland." Kevin Durant reflects on the Warriors' 108-100 win and looks to have another successful year in their last season at Oracle Arena. Durant takes a tour of Warriors' new arena. 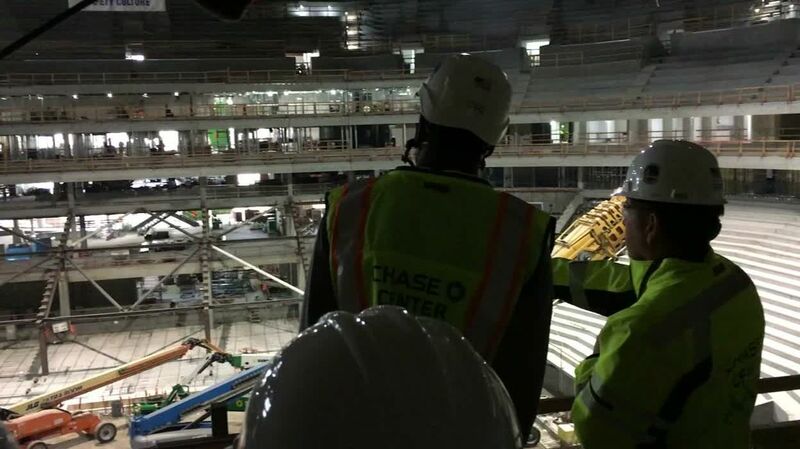 Sporting a hard hat, Kevin Durant learns more about the Chase Center, which is scheduled to open next season.